Laquan McDonald. Gone but not forgotten. On October 20, 2014, a Chicago cop murdered 17 year-old Laquan McDonald. He unloaded his full magazine – 16 rounds – into Laquan as he (Laquan) lay on the ground. Then the system went into action. The story the police put out was that Laquan had lunged at them with a knife. Not a single cop present contradicts this story (never mind acting to prevent this murder in the first place). The corporate media faithfully parrots the police line, with no questions asked. See this story from the Chicago Tribune on the day after the murder, for example. A CCTV security camera on a nearby Burger King mysteriously has the footage of this murder missing after the cops gain access to it. The City of Chicago refuses to release the police car dash cam recording of the murder for over a year. During that period, the family of Laquan gets the recording (after suing) along with a settlement of $5 million and… agreement to keep the recording secret. The capitalist media do nothing to gain access to the dash cam recording, but an independent journalist brings suit under the Freedom of Information Act. On Nov. 24, the cop who unleashed the barrage on Laquan is arrested for murder… and then the dash cam video is released. It is clear that the entire system has participated in this cover up. 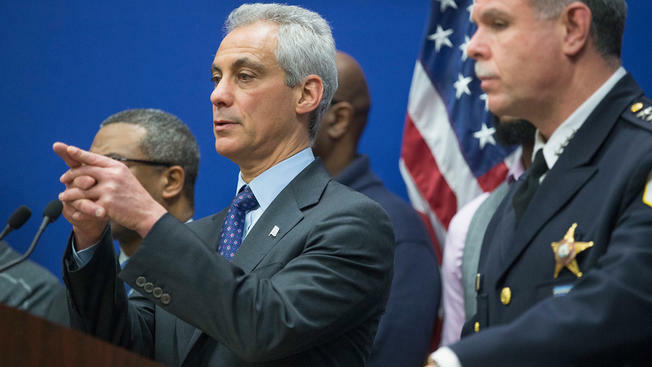 Democratic Mayor, Rahm Emanuel, claims he never saw the recording until it was released. If that is true, then he is guilty of intentionally not knowing what his cops are up to, but most likely it is a bold faced lie. Chicago mayor, Rahm Emanuel and Chief of Police Garry McCarthy. By covering up this murder, they are setting the stage for the next one. The cops who participated in the lie about what happened? Nothing is said about them. The Chief of Police and the City Attorney, both of whom have tried to cover this up too? The wheels are in motion to keep the pressure off of them too. The murderer – Jason Van Dyke. Who is he? one of these infiltrators? There are other reports that many police are on steroids and go into “roid rage”. Is Van Dyke one of these? Of course, this murder is not just a crime of one individual “bad cop”; the events as explained above show that the entire system collaborated to keep the truth from seeing the light of day. But another part of this propaganda campaign is the hiding from us of how many truly dirty cops are walking the streets. Then there is Bernie Sanders. After Obama’s “change you can believe in” we now have Sander’s “political revolution against the billionaire class”. But evidently that “revolution” doesn’t include anything against police racism and murder or the cover up by the Republicrat establishment and the corporate-controlled media. Karen Lewis, head of the Chicago Teachers Union. She may participate in a symbolic march, but she’s not seeing to it that her union really organizes to stop this police crime wave. in protest against this murder, but that’s just for show. Look at the web site of the union: There’s nothing on it about this murder or the issue in general. And all the rest of the union leadership remains silent as they continue to support the Democrats. The events in Chicago are not about one racist murder. We’ve been seeing these murders, and the cover-ups of these murders for years. Each cover-up helps set the stage for the next such murder. Clearly, the entire capitalist system is guilty. This includes its police force, its media, and its two political parties. Never was it more obvious than in this case. Never was the necessity for a real revolution obvious. That’s why it is so criminally mistaken for the nation’s most prominent socialist, Seattle City Council member Kshama Sawant, to be silent, just as she was silent for days after Israel started its criminal attack on the people of Gaza last year. Ultimately, after it became too embarrassing, she felt forced to say a few words. But what will she say this time? Will she condemn not only the police and the Democratic mayor, Rahm Emanuel? Or will she point out the obvious – that Bernie Sanders, too, is participating in the cover up? An e mail fund appeal from her group, Socialist Alternative, does the opposite. Yes, in addition to trying to capitalize on this murder to get money they actually imply that Sanders is opposing these murders and cover-ups! In this time, when a real socialist program is needed more than ever, they are giving socialism a bad name. No confidence in the police or any civilian review board (which will be controlled by the cops, themselves). For democratically elected community patrols/community committees of public safety! No confidence in any wing of the the Democratic Party, including Bernie Sanders! They are part of the cover-up and part of the problem! For the movement to run its own candidates for public office, starting at the local level. This includes the movement against police racism and murder, the real movement against fracking (vs. Big Green), etc. How Did We Become Humans and How Did Early Humans Organize?